Bobby Joe Ebola and the Children MacNuggits. 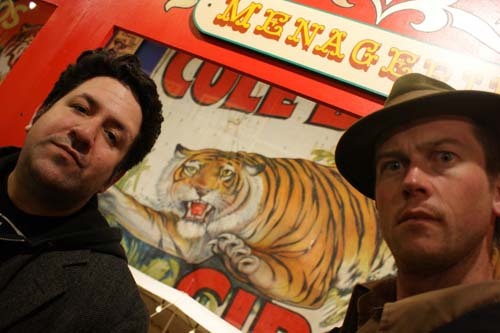 Part One – Interview with Dan Abbott (guitar, vocals) and Corbett Redford (vocals), the talented musical comedic duo who make up the band, who have reformed after a 10 year hiatus. Today you could easily make comparisons to Tenacious D or Flight of the Conchords, but Bobby Joe Ebola were mixing folk, pop, rock, and punk music with dark lyrics and creating their own unique brand of “pretty songs about awful things” long before these acts were popular. In part one of this interview, the two discuss the origin of the band, and how hard it was to get shows while fighting the “novelty band” stigma. It was so bad the local all ages club known as 924 Gilman (The “Alternative Music Foundation”) wouldn’t even book them, so out of necessity they founded their own record label S.P.A.M. Records with friend and fairly regular backup singer John Mink (aka John Geek). They also created and booked their own festival “Geekfest“, had a few of their songs also appearing on the Dr. Demento show,and went on to achieve legendary underground and cult status performing over 1000 local and national gigs. In time they even began headlining the very club that said they were “to alternative” to play. Credits: “MLR Intro” by “Rob McCann, “Life is Excellent” by “Bobby Joe Ebola & the Children MacNuggits“, “Wryting Love Songs (Will Never Help Me Get the Chycks) ” by “Bobby Joe Ebola & the Children MacNuggits“, “Postcards from Inferno (See You in Hell)” by “Bobby Joe Ebola & the Children MacNuggits“, “The Dog Ate the Baby” by “Bobby Joe Ebola & the Children MacNuggits“, “In the Barrel Slide” (Performed Live in MLR Studios) by “Bobby Joe Ebola & the Children MacNuggits“, “Mr. Abuse” (Performed Live in MLR Studios) by “Bobby Joe Ebola & the Children MacNuggits“, outro “Life is Excellent” by “Bobby Joe Ebola & the Children MacNuggits“.